Hand blown and shapely designed colored glass. These cordials will compliment any occasion. UNIQUE AND LOVELY! Beautiful Mouth Blown & Hand Crafted liqueur cordial glasses. 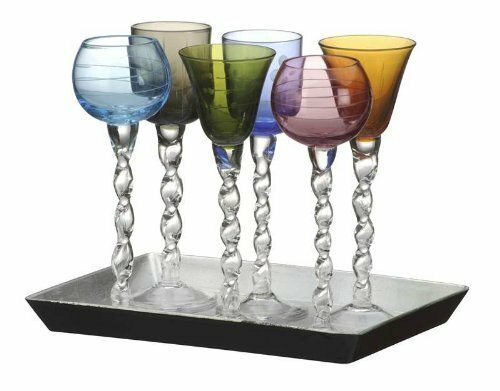 With elegantly long, twisted stems, each glass has a different shape and unique patterned etching. Assorted Jewel Colours. IMPRESS YOUR GUESTS! Ideal for cocktails, aperitifs, or a sip after dinner. With an Acrylic Serving tray with weathered effect silver finish. Designed and made by Artland.